Thanks in part to the release of his popular collaboration with Target earlier this year, Jason Wu is one of the hottest designers at the moment. 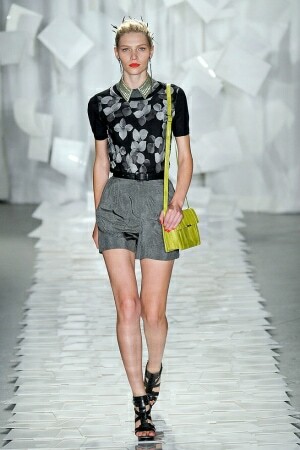 Although he is known for his polished and feminine designs, Wu is also quite the trendsetter – many elements found in his Spring 2012 collection have gone mainstream this season. For example, peplum, citron yellow and high-low skirts were all featured prominently in Wu’s spring collection and all three are über-popular trends at the moment. When those styles were mixed with Wu’s girly aesthetic, he created some totally chic springtime ensembles. Although colorful outfits usually dominate for spring, Jason Wu played with many black, gray and white ensembles this season. However, Wu kept this black and gray look anything but boring by adding interesting details, like the floral print top and jeweled collar. And for some major contrast, he added a citron yellow bag, which really punctuated this monochromatic look. Get some Wu-inspired style by pairing a black and white floral print top with structured gray shorts. A collar necklace mimics the look of an actual collar without adding an extra layer of bulk, while color-blocked earrings make a chic statement. Comfy woven sandals make this look appropriate for daytime and the citron yellow bag adds that much-needed pop of color. Whether you call it a “high-low,” “mullet,” or “asymmetrical hem” skirt, one thing is for sure — the mini-meets-midi skirt hybrid is hot for spring. In one of his looks featuring this trend, Wu paired a blue high-low skirt with a bright yellow blouse for an ensemble that looked prim and polished, yet youthful and flirty. For a similar look, tuck a bright yellow blouse into a printed blue high-low skirt. A simple black belt helps to define the waistline, while a beaded yellow necklace adds interest. Accessorize with petal-shaped earrings — these ones mimic the design found on Wu’s original skirt — and a pair of simple ankle-strap sandals. Figure-flattering peplum has been everywhere this season and Jason Wu’s exaggerated pink peplum skirt definitely created a bold, yet feminine statement. Wu paired the skirt with a simple white top and black shoes to make the skirt the true focus of the look. For this look, start by pairing a white pointelle blouse with a pretty pink peplum skirt. Accentuate the skirt’s hourglass shape by adding a belt with a cute bow detail for a fun and flirty vibe. Simple stud earrings and a wraparound watch make a sophisticated statement while these unique criss-cross pumps dress up the outfit. What do you think of this collection? Are you a fan of Jason Wu? Which look is your favorite? Would you wear any of these outfits? Which designers would you like to see featured here next? Remember to leave a comment below and let me know what you think!